Swords and bloodshed aside, modern stadium sporting events share some similarities with ancient Roman gladiator fights of yore. As reported by Live Science's Megan Gannon (who is also a mental_floss contributor), archaeologists in Austria have identified remnants of an “entertainment district” around Carnuntum, a town east of Vienna that was once the Roman Empire’s fourth-largest city, and home to one of the Empire’s largest amphitheaters. Long ago, it contained bakeries, food vendors, and shops, so gore-loving spectators could shop for memorabilia and grab a bite to eat. 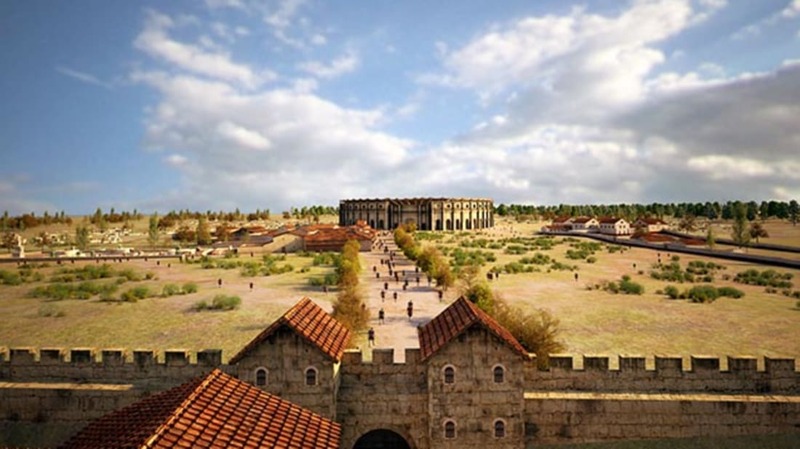 Carnuntum was founded during the 1st century CE as a fortified winter military encampment. Over the centuries, it grew into an important metropolis; by the 3nd century CE, it had as many as 50,000 residents. As for the city’s amphitheater, it was built in the first half of the 2nd century CE, just outside the city. It once seated around 13,000 people and was used for gladiator games. Archaeologists excavated the amphitheater from 1923 to 1930, but today, much of Carnuntum still remains hidden below ground. In 2011, a team of scientists used ground-penetrating radar devices and other noninvasive techniques to detect the hidden remains of a gladiator school, with training grounds, baths, and prison cells. Recently, the group—led by Wolfgang Neubauer, director of the Ludwig Boltzmann Institute for Archaeological Prospection and Virtual Archaeology (LBI ArchPro)—announced that they had found the entertainment district using similar technology. The entertainment district sat just outside the amphitheater, separated from the main city. It consisted of a boulevard lined with shops, which led to the amphitheater. Using other preserved Roman cities, like Pompeii, as reference points, Neubauer and his colleagues were able to determine which kinds of businesses patrons frequented. They identified taverns, thermopolia, also known as ancient food stands, and a granary with a large oven, which was used to bake bread. And since oil lamps with depictions of gladiators were once a popular souvenir, some of the shops probably sold trinkets to fans. Underneath these shops sat underground cellars, which stored wine and food. The archaeologists also found the ground plan of an older second amphitheater, just 1300 feet from the main one. It sits beneath a city wall, constructed after the ancient sporting complex fell out of use. “Not only in Rome were so-called ‘bread and games’ of great importance for the entertainment of the masses, but also in Carnuntum—a frontier-town along the Danube River, at the edge of the Roman Empire and on the border with barbarians to the north,” the scientists concluded in a press release. Check out digital reconstructions of the entertainment district below.